Kohlhaas? Was that Kohlhaas Walker? No: that's from Milos Forman's hugely under-rated film of E. L. Doctorow's novel, Ragtime, and it's spelled Coalhouse. Otherwise, though, Michael Kohlhaas and Coalhouse Walker have a lot in common, their quest for justice in particular. 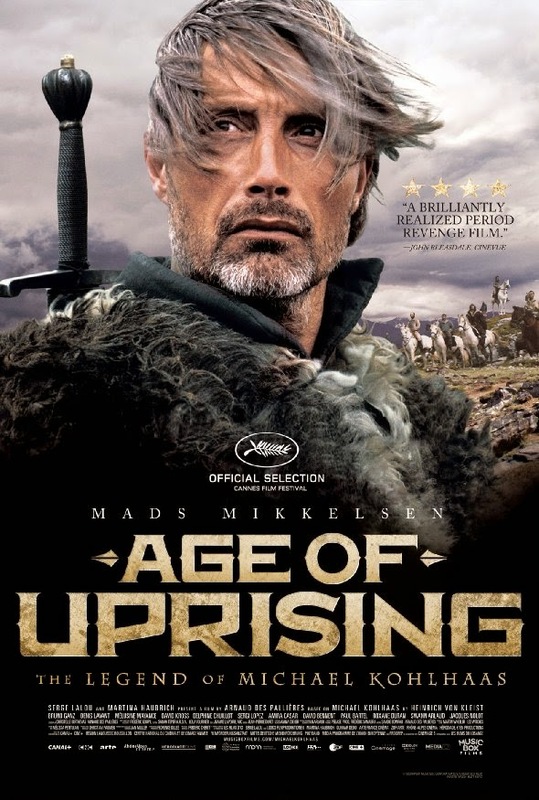 The new film, AGE OF UPRISING: THE LEGEND OF MICHAEL KOHLHAAS (a rather cumbersome title for what was simply called Michael Kohlhaas in Europe), during its first hour seems pretty much your typical clanking-armour revenge movie. Hang on, please, for the film's second hour proves so much better -- deeper, more encompassing and profound -- that if you have any interest in philosophy, class issues, religion, justice, the monarchy and Europe in the sixteenth century, I believe you will find this movie more than a little eye-opening and finally quite moving. 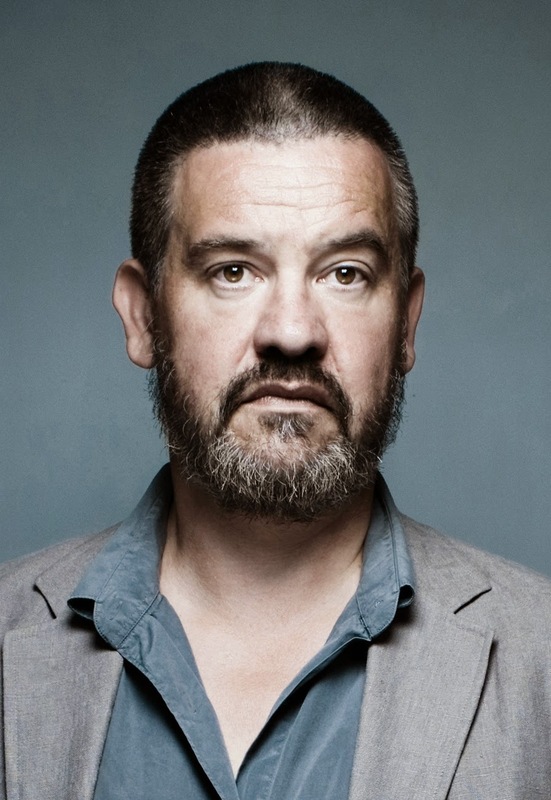 Director Arnaud des Pallières, shown at left, has given us a film that captures the "look" of the times, as well as a character, Michael Kohlhaas, who evidently did indeed exist. As co-adaptor (with Christelle Berthevas) of a novella by Heinrich von Kleist (whose work, according ot the IMDB, has been adapted for the screen some 57 times! ), M. des Pallières spills out his most impressive and thought-provoking work as the movie continues. Granted, his star Mads Mikkelsen (above, right), who possesses probably the most consistently riveting male face currently on screen, helps make that first hour more bearable. In it, our hero Michael, whom he plays, and very well, as a highly moral man, is taken terrible advantage of by the local Baron, illegally confiscating Michael's horses, then setting dogs on his much-loved servant, and finally... well, you'll see. By the end of that initial hour, our hero has rounded up (many of the men come to him of their own volition) a small army (below) of the disenfranchised and dissa-tisfied, and has killed a number of the Baron's henchmen. So far, so-so. Accord seems to have been reached, but then things change. How and why and what happens is profoundly moving and revealing of morality, justice and the balance of power as these were perceived and defined in the mid-1500s. 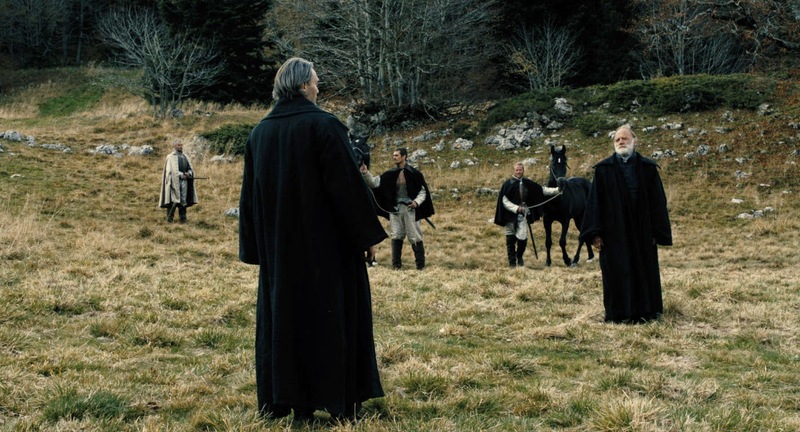 The final scene, featuring the wonderful Bruno Ganz (above, right, as a character called only The Governor) is spellbinding in every way, leaving us, as well as Kohlhaas both shaken yet somehow at peace, having begun to understand one's place in a world vastly larger than oneself. The filmmaker has managed to round up quite a starry cast in supporting roles, from Sergi López as a one-armed, would-be recruit and Amira Casar as the local Abbess to Mélusine Mayance (above, left, from Sarah's Key) as Kohlhaas' daughter and Jacques Nolot as his kindly but frightened lawyer. From Music Box Films and running 122 minutes, the movie opens tomorrow, Friday, May 30, in New York City at the Cinema Village, in the Los Angeles area at Laemmle's Music Hall 3 and Playhouse 7, in Miami at the Tower Theater, and in Phoenix at the Film Bar. Click here (and then click on THEATERS) to see further scheduled playdates.